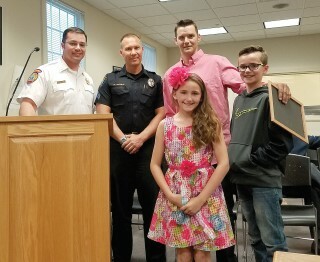 It’s not a usual custom to get teary-eyed during a town hall meeting, but that is exactly what happened at the Windham Town Council meeting on Tuesday, May 9 when the Windham Fire/Rescue and Police Departments presented an award to the Matthew Estes Family in honor of their dog, Caribou. A year ago, on the night of May 10, 2016 while Estes and his son Kyle and daughter Grace were sleeping, a fire broke out on the first floor of their home. Caribou, the family lab mix alerted Estes by making an unfamiliar barking sound and waking him up. It was at that point Estes became aware the downstairs was engulfed in flames.